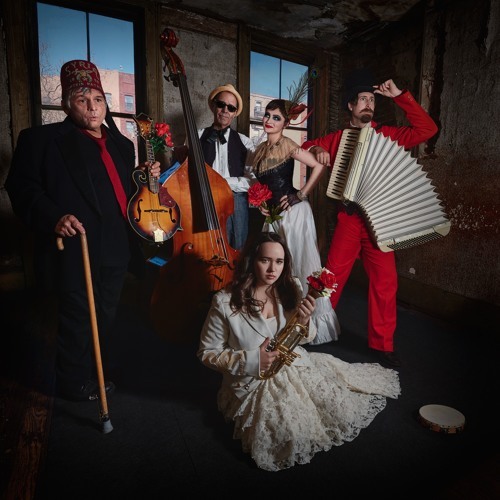 Your favorite little gypsy-cabaret band from NY! Orphan Jane is circus tents and gypsies, traditional blues and vaudeville, a dear friend of whom you're just a little afraid. Like a drink cut with sharp mandolins, wheezing accordions and thrilling falsettos, chased by the driving lines of a standup bass. A vocalist equal parts Lotte Lenya and Little Mermaid with a band of hooligans growling close behind. Orphan Jane was formed in late 2011 by eccentric jazz guitarist bandmaster, Dave Zydallis, and longtime friend and collaborator bassist Robert Desjardin, formerly of the Cadillacs. Together, Dave and Bob schemed and conned the remaining two band members, Jessica Underwood (vocalist) and Tim Cluff (accordionist), into playing with them under the auspices of joining a Kurt Weill tribute band. They released their first full length LP "A Poke in the Eye" in the Summer of '14 and are currently workshopping a stage production based on original songs.